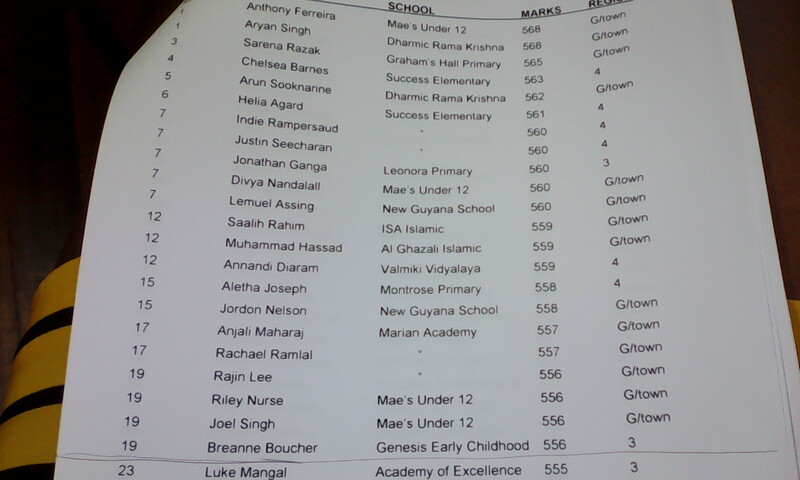 Anthony Ferreira of Mae’s Under 12 and Aryan Singh of Dharmic Rama Krishna have tied for the top spot in this year’s Grade Six examination with 568 marks each. This was announced today by the Ministry of Education. Below are the names of the top one percent. The top 10 results by region are also provided below. 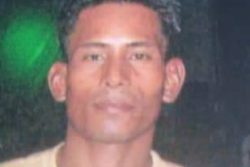 2 Yogita Sookra Queenstown Primary 546 "
3 Devanjali Ramkellawan Taymouth Manor Primary 542 "
5 Andriana Roberts Taymouth Manor Primary 534 "
7 Tyhecia Moore Hampton Court Primary 520 "
7 Darshan Mohamed Suddie Primary 520 "
9 Kelly Sankar Suddie Primary 518 "
9 Dhaniram Mahadeo Aurora Primary 518 "
9 Jadon Campbell Suddie Primary 518 "
2 Breanne Boucher Genesis Early Childhood 556 "
3 Luke Mangal Academy Of Excellence 555 "
4 Karuma Lall " 553 "
5 Arvind Naraine " 552 "
5 Javid Nizamudin " 552 "
5 Aditya Gobin Leonora Primary 552 "
5 Annalisa Charles " 552 "
9 Justin Persaud Academy Of Excellence 551 "
10 Faraz Yassin " 549 "
10 Lakeram Persaud Belle West Primary 549 "
10 Nabeel Baksh Leonora Primary 549 "
2 Helia Agard " 561 "
3 Indie Rampersaud " 560 "
3 Justin Seecharan " 560 "
5 Annandi Diaram Valmiki Vidyalaya 559 "
6 Aletha Joseph Montrose Primary 558 "
7 Ryon Sarjoo Swani Purnananda Pri 555 "
7 Jenifer Chulai Strathspey Primary 555 "
7 Reuben Cush Kuru Kururu Primary 555 "
7 Roshni Samaroo Valmiki Vidyalaya 555 "
3 Indrani Vanlange " 493 "
6 Victoria Outridge St John The Baptist Pri 482 "
7 Michael Cameron " 481 "
4 Akeel Bennett Micobie Primary 453 "
5 Asher Edinboro School of Excellence 448 "
2 Isharia Richardson " 528 "
4 Kayla Xavier " 507 "
5 Terrie Me Rae " 502 "
6 Simone James " 494 "
7 Keenan Williams St Ignatius Primary 487 "
8 Amish a Flaeera fall Arapaima Primary 486 "
9 Danielle Robeiro “ 483 "
9 Julissa Nelson St Ignatius Primary 483 "
2 Jaheim Joseph Royal Halls of Learning 548 "
3 Tieanna Croal Watooka Day Primary 544 "
4 Tyrell Davis “ 541 "
6 Danica Wilson Royal Halls of Learning 537 "
7 Emily Me Kenzie One Mile Primary 536 "
7 Carl Bovell Watooka Day Primary 536 "
9 Stephanna Wilson Royal Halls of Learning 535 "
10 Zabeda Rodrigues One Mile Primary 534 "
1 Aryan Singh Dharmic Rama Krishna 568 "
3 Sarena Razak Graham’s Hall Primary 565 "
4 Arun Sooknarine Dharmic Rama Krishna 562 "
5 Davya Nandalall Mae’s Under 12 560 "
5 Lemuel Assing New Guyana School 560 "
7 Saalih Rahim ISA Islamic 559 "
7 Muhammad Hassad Al Ghazali Islamic 559 "
9 Jordon Nelson New Guyana School 558 "
10 Anjali Maharaj Marian Academy 557 "
10 Rachael Ramlall " 557 "